“So here is where we are in track and field, back in an old familiar place to which the sport returns with dispiriting regularity, and seemingly evermore. Not just to storied Hayward Field (although there, too), but to a place where every moment is freighted with suspicion and these apparently simple–but actually very complex words–’clean” and “dirty’ are as much the currency of evaluation as minutes and seconds or feet, inches and meters. I shouldn’t admit this, but this nasty, necessary, and dispiriting controversy involving Alberto Salazar, the Nike Oregon Project, and — by association — a number of other athletes and coaches, has not ruined my enjoyment of Track and Field. Instead, I find myself becoming increasingly fascinated by how the allegations an rebuttals are pushing each of us to think about what really matters to us, and where we stand on matters of ethics and fair play. I sympathize with those who, like Tim Layden, are depressed and disillusioned by the stories about the NOP and its polarizing coach. I truly feel bad for those who find themselves unable to enjoy the sport when suspicions of ethical violations are rampant. I also understand the instinct to take sides. While there are many who are at the very least uncomfortable with Salazar’s approach and behavior, there are also many who passionately defend him (and no one is more passionate in his defense than Salazar, himself). These folks make the same point: he has publicly stated that he will do everything possible within the rules to help his athletes succeed at the highest level. That’s what makes him so successful. Why should anyone be surprised that he is obsessively involved in decisions about therapeutic use exemptions, and their impact on performance? I put myself in the former category. I’m very uncomfortable with Salazar’s conception of coaching, with the choices he has made for his athletes, and — going back many years — to the choices he made as an athlete. But I acknowledge that maybe there’s a little bit of crazy in anyone who makes it to the top. Maybe like Tom Cruise’s character in “A Few Good Men,” I can’t handle the truth, and don’t want to admit that victory comes at the price of extreme behavior. So this isn’t just about Salazar; it’s about us: about what we think is justified in the pursuit of medals and success. And shouldn’t we be mindful of that question any time we watch the very best athletes compete? Don’t we want to have some appreciation for the extreme dedication, the risks that brought them to such a stunning level of fitness? I don’t mean to equate the extremism of hard work with the extremism of cheating, but rather to point out that there is an obsessiveness in the pursuit of the pinnacle that is inspiring and, at times, apalling. On Thursday night I stayed up way past my bedtime to watch the women’s and men’s 10,000m finals at the USA Track and Field Championships. Maybe I was curious to see how Galen Rupp would handle the pressure and distractions of the last few weeks. Or maybe I just wanted to stop reading message boards and just watch people run. I watched both events with rapt attention. Unlike network broadcasts, the usatf.tv feed provided uninterrupted coverage of the races. I was thrilled to see Shalane Flanagan ignore the ninety-degree temperatures and set a punishing tempo from the beginning. I watched with growing anticipation as Molly Huddle took control and, in the final laps, pulled away from Flanagan and Emily Infeld to win the national championship. Then I watched Rupp deliver what announcer Tim Hutchings described as a “master class” in finishing, dropping a 58-second penultimate lap to break Ben True and leave the rest of the field in tatters. 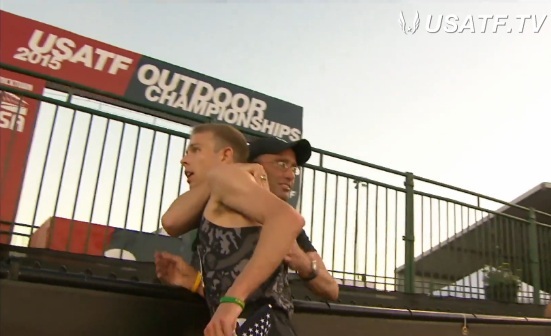 It was easy to see Rupp’s professional dismantling of the field, his seventh consecutive national title, as his answer to the allegations leveled against him and his coach. The point is, I enjoyed these races thoroughly. Did all the controversy add to my enjoyment. I don’t know. At some point this last week, I had an odd thought. What if this entire episode turned out to be really great for Track and Field? What if the bitterness and the rivalries, the trash talking and the take-downs end up driving ratings? What if Track and Field needs a villain, or at least, a highly complex, driven figure capable of inspiring intense hate and intense admiration? This entry was posted in Coaching, PEDs and Drug Cheating and tagged Alberto Salazar. Bookmark the permalink.